About two kilometres out of town, though town grows ever closer, Palm Village is a charming, excellent value spot set among fields and backroads, and makes a pleasant intermediary between guesthouse and boutique options. Ad Book now! Rates from US$39++. Average rating 8.3 from 272 reviews. The entrance leads directly into a large wooden restaurant with a pool table and plenty of seating, and is where you will likely be greeted by the hotel’s friendly dogs. From there, a winding stone path, flanked by dense palms and flowering bushes, leads to individual bungalows the exteriors of which are cladding in palm wood and interiors in bamboo, to lovely effect. Inside, rooms are cosy, with TV, hot water, and some with air-con. The interior furnishings are all made of palmwood and loads of bedlinen is provided. Bathrooms are super bright thanks to skylights, shaded by canvas awnings. In addition to standing showers, they have massive sandstone baths for splashing about in. The outside pool is well-shaded and large, and has to be one of the coolest pools in Siem Reap. There’s a massage area beside it, and also a tower-platform for watching the sunset over the countryside. They also hold yoga sessions here four days a week, which are currently led by a highly respected Ashtanga yoga teacher. A petanque pitch has been built in among the trees, and there’s also a ping-pong table if lounging by the pool becomes too indolent. 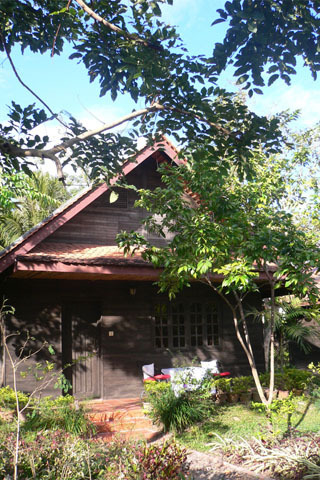 The family suite is in a reconstructed traditional Cambodian wooden house on stilts, and is excellent value for money. A tuk tuk into town costs $3, where the driver will wait for you and take you back for $3. This cost should be integrated into your calculations. All prices include breakfast and airport pick up. Check rates at Palm Village on Booking.com.